Yes, it's possible to do both. Here's how: Simultaneously increase employees' engagement and lift their well-being. American business leaders who are angry, worried, and frustrated by rising healthcare costs should know this: When a company increases employee engagement and well-being, it lowers medical costs and improves worker performance, according to Gallup. Yet despite these clear benefits, less than a quarter (22%) of American employees are engaged in their jobs and thriving in their overall lives. Business can do better. Only 22% of American employees are engaged in their jobs and thriving in their overall lives. One of the more intriguing findings Gallup discovered while studying engagement outcomes is that engaged employees are generally in better health than employees who are not engaged or who are actively disengaged. They have lower incidences of chronic health problems such as high blood pressure, high cholesterol, diabetes, obesity, diagnosed depression, and heart attacks. They also eat healthier, exercise more frequently, and consume more fruits and vegetables than their not engaged or actively disengaged counterparts. Further, engaged employees are more likely to be involved in employer-sponsored wellness programs. These findings suggest that employers who make an effort to improve their workers' engagement levels will help employees improve the quality of their lives, minimizing the costs of decreased productivity resulting from chronic illnesses. In addition to measuring workers' engagement levels, Gallup measures their well-being levels and categorizes them as thriving (strong, progressive overall well-being), struggling (moderate or inconsistent overall well-being), and suffering (well-being that is at high risk). 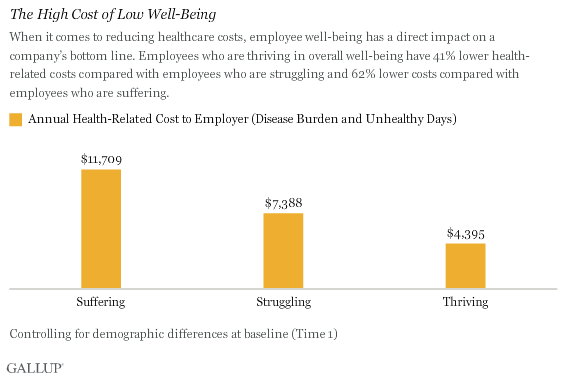 Gallup discovered that employees who are thriving have 41% lower health-related costs compared with employees who are struggling -- and they have 62% lower costs compared with employees who are suffering. Currently, slightly more than half (58%) of employees in the U.S. workforce are thriving. These findings suggest that if employers made an intentional effort to raise well-being levels for all workers, they would realize significant savings in their medical costs. Gallup found that employees who are thriving in their lives overall are more than twice as likely as those who are struggling to be engaged in their jobs -- and nearly six times as likely to be engaged as those who are suffering. Furthermore, when employees are engaged and have thriving well-being -- as are 22% of American workers -- they are more likely to be agile and resilient. For these employees, both their workplace lives and their overall lives are operating smoothly, so major organizational changes or disruptions in their personal lives are unlikely to throw them off course. They are physically healthy, have strong relationships, are active in their communities, and are in control of their finances. They also enjoy their work and are 13% more likely to report excellent performance and 32% more likely to stay with the company than are engaged employees who are struggling or suffering. Likewise, engaged, thriving employees have fewer health problems and are therefore a lower healthcare liability to their employers. Compared with their engaged but struggling/suffering counterparts, they have 46% fewer unhealthy days as a result of physical or mental illness, are 39% less likely to be diagnosed with a new disease in the next year, and are 43% less likely to be newly diagnosed with anxiety or depression. These findings add up to big savings for companies' medical costs and help boost productivity numbers. Though some supervisors might expect employees to compartmentalize their work lives and their personal lives, great managers know that the whole person comes to work and that each employee's well-being influences individual and organizational performance. These great managers inspire team engagement and performance in part because they invest in their employees' overall lives and well-being. In fact, business leaders and managers can play a major role in developing an approach to improve the workplace environment -- and potentially their workers' health and well-being. Make well-being a company strategy -- like other business outcomes. Healthy behaviors are contagious. Employees influence each other, so any strategy should capitalize on this powerful chain of influence. Also, leaders who have thriving well-being are more likely to have thriving employees. Communicate a commitment to well-being consistently in all of the programs the company offers. Companies can help employees become more conscious of their well-being and understand how to improve it through various corporate programs and benefits. These benefits could include offerings such as 401(k) programs, social or community activities, health-risk assessments, exercise equipment, employee assistance programs, and nutrition information programs. Hold leaders accountable for well-being programs available to employees. Leaders should constantly evaluate well-being improvement programs. Hold the company accountable by measuring well-being and tracking improvements. Evaluate the effectiveness of existing programs to ensure that they are motivational and connect to the right outcomes. Embed activities that increase well-being in individual development plans and goals. Encourage well-being goal setting by having people share their goals with at least one person (if they feel comfortable sharing). Encourage employees to document their goals and track their individual well-being. Create activities that promote peer discussions on well-being topics. Set positive defaults to help workers make smart, healthy choices. Make it easy to participate in 401(k) programs, contribute to savings accounts, or take part in health and wellness programs. In vending machines and cafeterias, make sure that healthy snacks and drinks are the most accessible. Offer plenty of opportunities to join physical or social activities throughout the day. Look for other easy ways to incorporate well-being activities into the day-to-day routine at work. Companies are in a unique position to make a real difference in their employees' lives. Because organizations are structured into teams and departments, they have a built-in social network through which they can change well-being and engagement. Leaders should not let that advantage go to waste. Individual well-being, engagement, and a culture of well-being link to important organizational outcomes. Here's how executives can build a culture of well-being that will help their organizations thrive. Managers should know that serious health and work problems can arise from even minor shifts in employees' well-being, according to a recent Gallup study. Here's how to address this problem. Because gross domestic product follows "gross national well-being," leaders need to understand what well-being tells us, the impact it has on citizens, and most importantly, how to increase it.